Louis Bowden and Rina Hayamizu will not forget their outing at the All England Club in a hurry – despite missing out on lifting the trophy at the Road to Wimbledon National 14 & Under Challenge Finals. 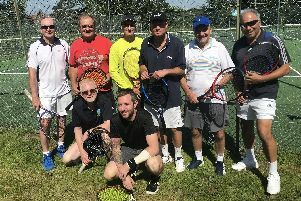 After triumphing at the regional finals, Old Portsmouth’s Bowden and Hayamizu, from Southsea, took to the famous grass courts looking to be crowned national champion. Hayamizu, who trains at Portsmouth Tennis Academy, put in a promising showing but saw her adventure ended at the quarter-final stage as she was beaten by Maialen Idiakez. And while also unable to better former British number one and two-time Wimbledon champion Andy Murray in getting his hands on a title at SW19, Bowden, 13, insists it has only fuelled his desire to come back to the venue again. The Warblington School student said: ‘It was nice – a lot nicer than the grass I normally play on! ‘The grounds are amazing and it was lovely to get the chance to play at Wimbledon. ‘I knew I was good enough to play having won qualifiers so that gave me confidence. ‘I’ve come as a fan five or six times and managed to see Andy Murray and Rafael Nadal play. The Road to Wimbledon began in 2002 and expanded initially to India in 2014. It has since added qualifying events in China, Hong Kong, India and Japan. Juniors participate in the UK in England, Scotland and Wales, starting in their club, park or school, with players qualifying for the county finals and then the national finals. Each year more than 10,000 youngsters take part in the series of national tennis tournaments, helping to inspire the next generation of Wimbledon stars. Former British number one Tim Henman was also in attendance for finals day and he admitted he had been impressed with what he had seen. ‘This event has been taking place for 15 years and the kids that come to Wimbledon make some amazing memories,’ he said. ‘The Championships is the biggest and best tournament in the world, so giving people the opportunity to experience the facilities and the grass is special. The All England Club Wimbledon and the LTA are fully committed to giving opportunities for 14 & under juniors of all standards to compete Nationwide in the Road to Wimbledon via firstly their club, park or school and to have the incentive to qualify to play in the National Finals on grass at Wimbledon.